Paris has been in “Niki Fever” for the last few weeks since the opening of the Retrospective exhibition at the Grand Palais. Congratulations to Camille Morineau, curator of the exhibition, and the passionate staff at the Réunion des Musées Nationaux (RMN) who made this show a success already. The exhibition will be on display until 2 February 2015 before it travels to the Guggenheim Museum in Bilbao. 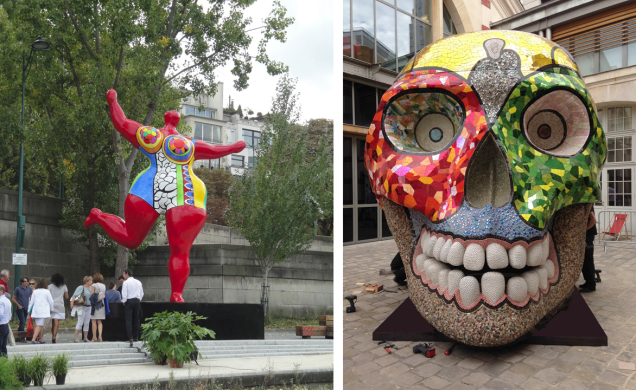 Nana Danseuse (Rouge d’orient – Bloum) (1995) is currently installed at the banks of the River Seine to celebrate the inauguration of Les Jardins de l’Archipel des berges de Seine Niki de Saint Phalle on 18 September 2014 by Paris’ Mayor Anne Hidalgo. In the presence of Saint Phalle’s family, the Mayor paid tribute to the artist’s accomplishments and revealed the commemorative plaque. Admission is free. On view until 2 November 2014. La Cabeza (2000) is featured at the CENTQUATRE until 9 August 2015. A collaborative effort between the Niki Charitable Art Foundation, the City of Paris and the Réunion de musées nationaux–Grand Palais brought this impressive mosaic sculpture to the 19th arrondissement. This is the first time La Cabeza has traveled outside of the USA for exhibition complementing the current retrospective of Niki de Saint Phalle at the Grand Palais. We would like to extend our thanks to Galerie Mitterrand and Galerie Georges-Philippe & Nathalie Vallois, the RMN and the City of Paris, as well as anonymous donors for their generous contributions, which made this endeavor possible. Admission is free. The Grand Palais auditorium features films by Niki de Saint Phalle on select Fridays (12 noon), including her adult fairy-tale Un Rêve plus long que la nuit (1975, 1h30) and psychoanalytical and explorative drama Daddy (1973, 1h23) directed by Peter Whitehead. 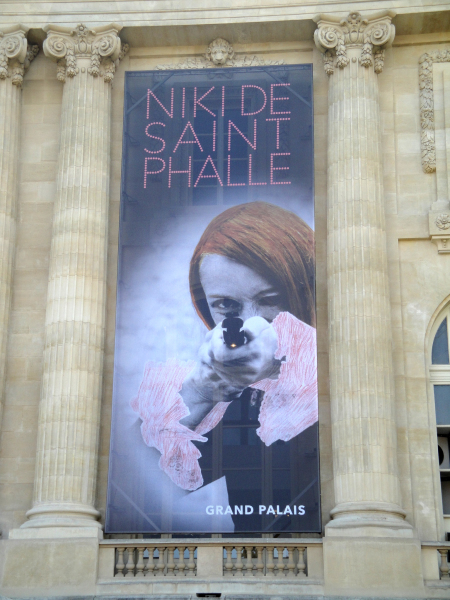 In the series Le choix de Niki (Niki’s choice) the Grand Palais shows films on select Wednesdays (6:30 pm) that Saint Phalle referred to as influential to her character and work. Please check local listings for dates and times. A new film by Louis Faure and Anne Julien titled “Niki de Saint Phalle, un rêve d’architecte” will also be shown at the museum’s auditorium every Monday, Wednesday and Friday until 2 February 2015. The film discusses Saint Phalle’s monumental works worldwide in a narrative accompanied by scenic camera movements that let the viewer experience the artist’s vision from a new perspective. Please check local listings for times. Children’s Workshop. Children can create their original artwork inspired by Saint Phalle’s assemblages or target paintings after a guided visit through the exhibition. Recycled materials are being transformed into art of today’s context. Duration is 2 hours. Click here to make reservations. HEADS Up for the new exhibition NIKI DE SAINT PHALLE: NANAS 60s-90s at Galerie Mitterand from 24 October to 20 December. Galerie Mitterand has been instrumental in previous and current research to find Niki de Saint Phalle’s NANAs worldwide for an upcoming online Catalogue Raisonné of Nanas. More information on how to submit entries are posted on our website.